Fifth time is a charm. Microsoft published KB4469342, a new cumulative update for Windows 10 version 1809, to the Release channel today. The company released four previews of the patch to Windows Insider systems for testing in the past couple of weeks which it did not do previously. While it is too early to tell if Microsoft will use the testing system in the future, it would certainly be good for update quality if it did as it would push updates to another set of test systems before making them available to the general Windows population. The October 2018 Update was one of the buggiest feature update releases for Windows 10 ever since Windows 10 was released in 2015. The update introduced a large number of bugs and issues, from data loss to font and audio playback issues. Microsoft had to stop distribution for six weeks to fix the most pressing issues. The cumulative update KB4469342 is the fourth cumulative update for the Windows 10 version 1809 release channel. It fixes a large number of issues including some that plagued users ever since the release of the operating system version. Fixed the issue that prevented users from setting Win32 programs as the default for certain app and file type combinations. Fixed the issue that prevented mapped network drives from reconnecting on start. Addressed an issue in Microsoft Edge that made file uploads to file hosting services on the Internet fail. Fixed a performance regression in Microsoft Internet Explorer if the Microsoft Compatibility List is not used or if roaming profiles are used. Fixed several time zone related issues. Fixed an issue that caused display settings to stop working on multi-monitor setups. Fixed a black screen issue on servers when waking a display from sleep mode. Fixed a long delay issue in the Camera app when taking photos. Fixed a playback issue for Hulu live TV from playing in Microsoft Edge. Fixed an issue with Bluetooth audio device playback stopping after several minutes of playback. Fixed a Brightness issue that would reset the slider to 50% on restart. Addressed a sysprep /generalize issue. Fixed a Microsoft Intune issue that would mark devices as not compliant. Fixed a performance issue with vSwitch on network interface cards that do not support Large Send Offload (LSO) and Checksum Offload (CSO). Wi-Fi policy for service set identifier filtering updated to "avoid filtering out Wi-Fi Direct devices". Fixed an issue that caused rasman.exe to stop responding. Fixed an issue in the Registry that caused regedit.exe to fail to add double null terminator to REG_MULTI_SZ values. Fixed an issue in RemoteApp that caused the RemoteApp window to disappear. Issue with Nvidia drivers that may cause Microsoft Edge to crash or hang -- Solution is to install updated drivers that correct the issue. Issues with the Seek Bar in Windows Media Player -- Microsoft promises a resolution in mid-December. 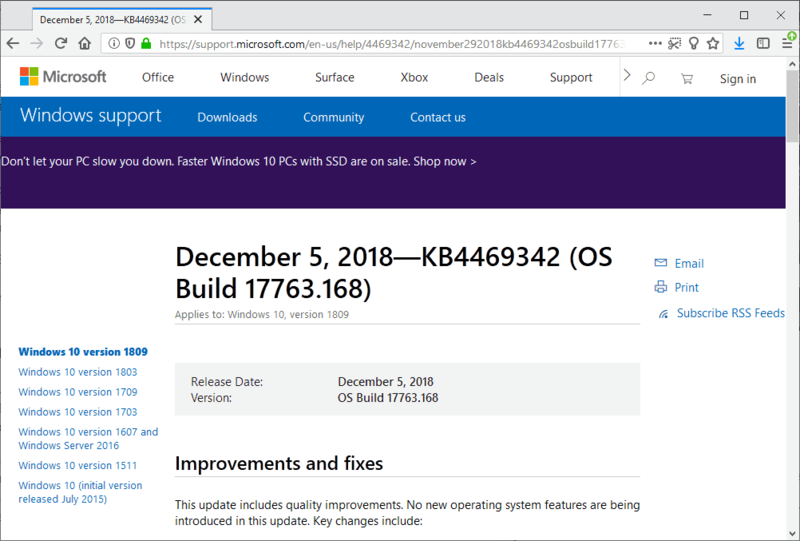 KB4469342 is available via Windows Update and as a direct download on Microsoft's Update Catalog download site. Windows 10 v1809 should be skipped by users just like Windows Millenium and Vista. Just because no one knew how to write drivers for NT6 before W7’s release or the fact most manufacturers tried putting it on underpowered laptops and put a lot of unnecessary software on them too which slowed Vista down even more, doesn’t mean it was bad, heck, Vista SP2 is really good OS, I personally like it even more than W7. My issue not listed above with KB4469342 is that defined VPN stopped working (are unconnectable) with message like “modem not configured properly” or “invalid security settings”. 100% disk Utilization on serveral Windows 10 1809. Maybe this update will work. Servicing stacks update the code used to install cumulative updates. If they’re missing you’ll have problems updating to later versions. I have updated from W10 1709 to W10 1803 17134.441 successfully, HDMI works! You have to accept the EULA to gain entry after which they’ll all be displayed according to version. CCleaner 5.32 (the last version made by Piriform) don’t start anymore, compatibility assistant reports “CCleaner can’t run on Windows”. W10 compatibility service can be disabled with no single problem at all. Be VERY careful with older versions. Use them at your own risk. Registry entries and file locations can change. We all know how “good” MS is at informing the users. Newer versions are updated to deal with this. Older versions may do more harm than good. I installed this yesterday, and today when looking manually for updates it got installed again.. WTF? On 4 computers. Windows Update does not offer this here (yet?). I’m tempted to download it but best to hold off. Did they fix the problem with wpprecorder.sys BSOD for WinToGo? No, of course not. I had to do it on my own. But people do upvote that they want a grey theme besides the dark and light one. All what I want is a stable working OS and then we can talk about feature updates, and yes I don’t remember that I had all those problems with Vista. The fact is that in the insider channel most people do install the OS in a VM and don’t even catch others than the most obvious bugs. W10 could be the best OS by Microsoft, however the absolutely madness and nonsense of twice-per-year upgrades have ruined all the hope about it. Anyway, it still works pretty well considering all the fiascos manufactured by MS development team along time. I have now installed version 1803 after one year stuck at 1709, however the upcoming 1809 is still not shown anywhere, so probably I will stay in 1803 one single month (more or less, who knows), such stupidity reason for the common sense of one single user who only wants that things work stable and fine. To-day they announce the diffusion and recomend to install it (finding the update).